"What strikes one immediately in their performance is the remarkable mastery they manifest in presenting the traditional instruments and music of the Andes; to the point that we came to forget that neither one is really from the culture that they transmit so well. This explains without a doubt the time, the patience, and most of all, the passion that Francy and Edmond have invested in the research and study of this ancient tradition." "Listening to 'Cosecha' … one is struck by the variety of sounds (together the duo play 25 instruments) and the subtly complex interweaving of rhythms. Love songs, courtship dances, agricultural songs and festival themes are blended with neo-traditional originals. All are fascinating and exquisite." 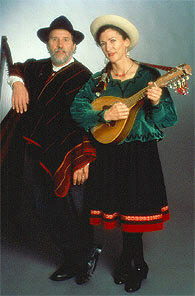 "Their renditions of Andean musics reflect the musicians' wonderful blend, when singing in duet, and their remarkably close attention to every stylistic detail appropriate to the particular regional music: harmonic underpinnings, melodic lines and inflections, vocal tone qualities, phrasing, and rhythmic accentuations."